Canal Place, located on the Chesapeake and Delaware Canal, has been in the Dann family since the 1950’s. Dann Marine Towing moved to Canal Place in 1985, and began restoring this historic landmark that has served the marine industry in so many ways for over 100 years. Canal Place is a 100 acre marine facility that serves as DMT’s base of marine operations. 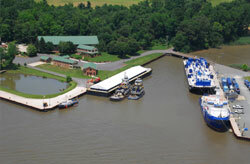 A fully bulk headed facility, with over 1200 feet of dock space, Canal Place services all of DMT’s tugs and barges. Shore power, water, and crane service are available 24 hours a day.